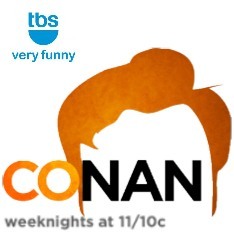 Here’s the skinny… Upon the passing of her father, James “Buck” Buchanan Duke (American Tobacco Company, Duke Energy Company) in 1925, twelve-year-old Doris Duke inherited an estate (in trust) valued at nearly $80 million (equivalent to $1.148 billion, in 2019). Fast-forward to 1935, and 22-year old Doris has married aspiring politico James Cromwell, and the two have embarked on a 10-month honeymoon of the Middle- and Far-East, including Egypt, India, China, and Japan, concluding with an extended stay in Hawai’i. 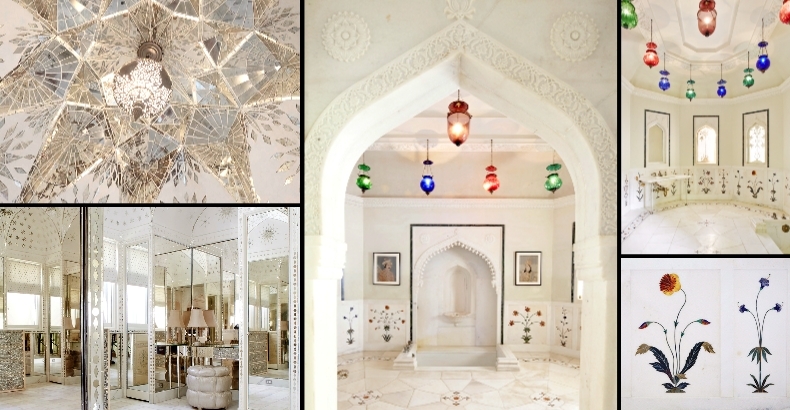 It was in India, after a visit to the Taj Mahal, that Doris commissioned the design of a marble bedroom suite, for a home she intended to build in the US; with the craftsmen of Agra’s Indian Marble Works executing the carved marble and inlay work. 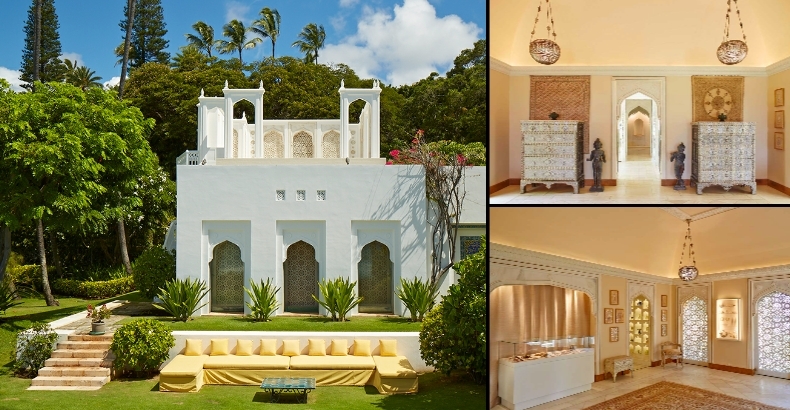 This suite of rooms would mark the beginning of Duke’s collecting of Islamic art; and eventually became the Mughal Suite at Duke’s as-yet-imagined Hawaiian retreat, Shangri La. 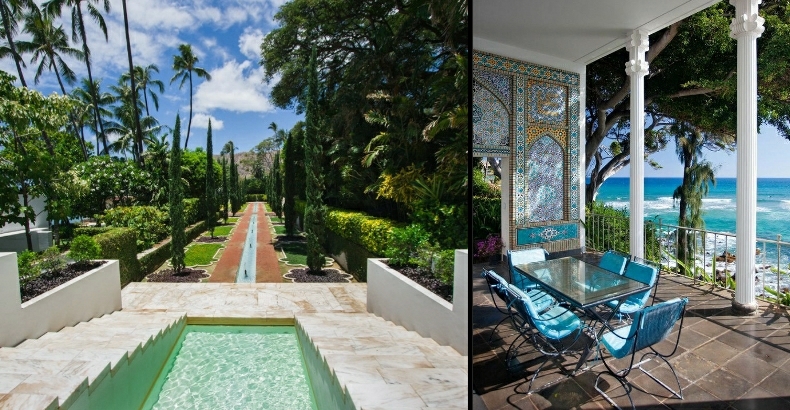 Having developed simultaneous loves for both the art and architecture of the Islamic world, and the island paradise of Hawaii, Duke decided to build a home that would incorporate both, and from 1936-1938, in collaboration with architect Marion Sims Wyeth (not to mention the 150 full-time workers who literally did the ‘heavy lifting’), that’s exactly what she did. 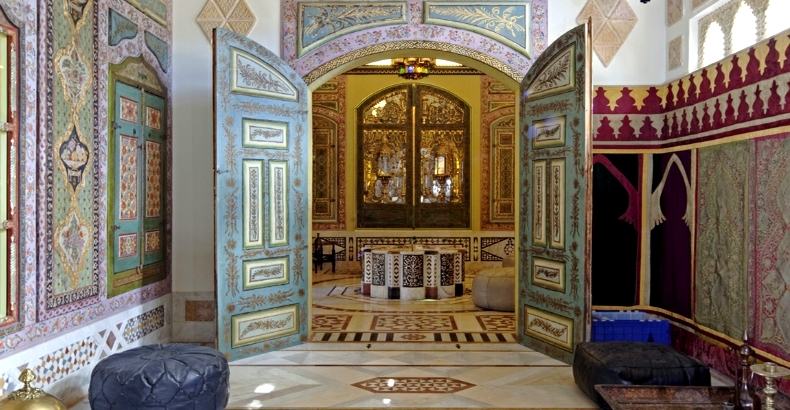 While the estate was under construction, Duke traveled throughout the Middle East and made a number of large commissions from artisans in India, Iran, Morocco, and Syria; while simultaneously acquiring and transporting enormous mosaics and entire rooms, for the estate. It’s interesting to note that while most Islamic art is religious in nature, Duke was not Muslim (nor by any accounts religious); and as such her collection was acquired more as a testament to the craftsmanship and artistry behind the pieces, than for any religious significance. Further, the place where she’d chosen to build her home (Hawai’i) was just as important to her as those items with which she filled that home. 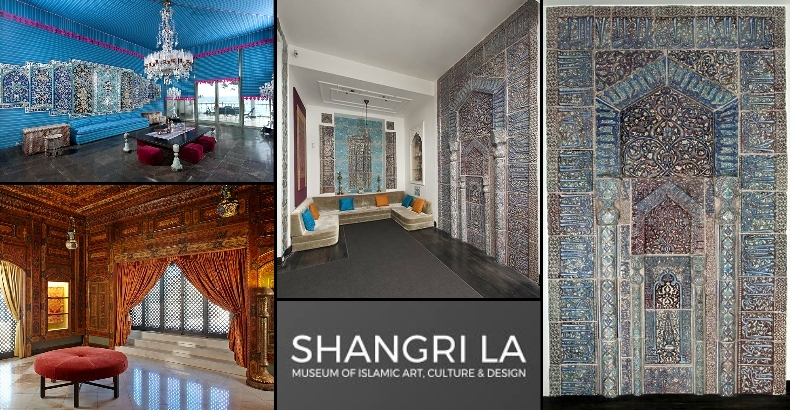 ** This was the coolest aspect of Shangri La, to me; the way she curated and arranged her collection. Mosaics are “framed” and displayed, much like paintings in a gallery; and none of the mihrabs or prayer alters in Shangri La – including the lusterware mihrab, signed by Ali ibn Muhammad ibn Abi Tahir (dating to 1265) that originally had been made for the shrine of Imamzada Yahya in Iran, that is considered the focal point of both the collection and the house – actually face East (toward Mecca), but rather look to Diamond Head in the west. *** I also enjoyed seeing how Duke was far more interested in putting her pieces to work (like the seventh century Persian ceramics that she’d had drilled and repurposed as lamps), than letting them collect dust in some warehouse. I was further impressed with Duke’s choice of flooring. 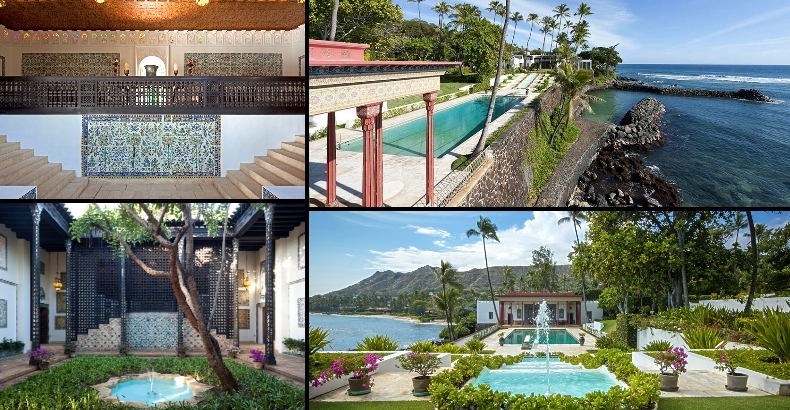 Custom tiles made from polished lava rock (mined in Hawaii) covered the floors in the dining room, living room, and terraces; while custom tiles of coral were utilized in the foyer, on the stairs, and in the halls. Excavated from the seabed in front of Shangri La, this coral was only able to be quarried because Duke traded six miles of beachfront (in what’s now Kailua) to President Franklin D. Roosevelt, in exchange for ownership of the land beneath Shangri La’s oceanfront property. 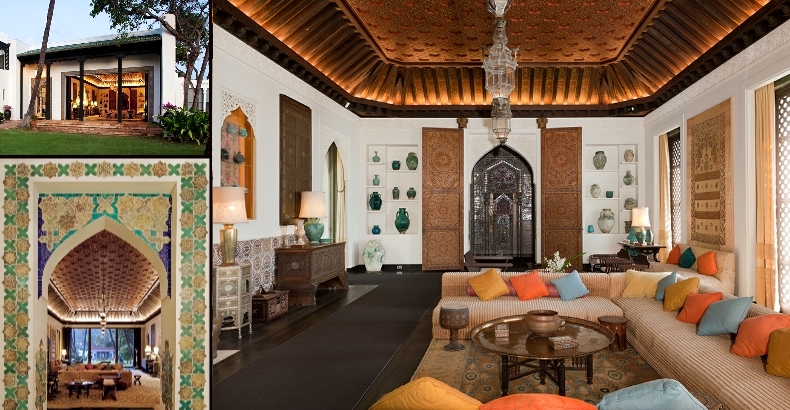 Whether the nineteenth century Baccarat chandelier in the Dining Room (with an abundance of red-and-green, as it’d been designed for the Indian market), the Mughal Suite (with its stunning marble and mosaic dressing room and bathroom), the Playhouse (the poolside pavilion inspired by Iran’s Chehel Sutoun), the Damascus Room (with its stunning ‘ajami paneled walls and ceiling), or the Mughal Gardens (lush and symmetrical); there are just so many wonderful things to see at Shangri La. I’m only sorry I wasn’t able to spend more time, there.